Chiropractic, osteopathy and physiotherapy, Winchester. If you suffer from any kind of back, neck or joint pain, then rest assured you are in the best possible hands. Unlike other clinics, which tend to treat a wide range of conditions, Agilaflex specialises exclusively in the diagnosis, treatment and management of back, neck and joint pain. We are not an alternative therapy centre. Nor do we simply offer a choice of chiropractic, osteopathy or physiotherapy. Uniquely for the Winchester area, we deliver a fully integrated complementary service that brings together all three principal manual therapies under one roof. This means that your initial assessment is the same no matter which of our practitioners you see. Only after diagnosis will you be assigned the most appropriate clinician. This removes the question of which approach is best for your needs until after you have been assessed. In contrast to traditional multi-disciplinary practices, where clinicians are self-employed and maintain their own client base, our clinicians are directly employed by us. This gives us the flexibility to move beyond restrictive professional boundaries when determining your course of treatment – be it with a chiropractor, osteopath, physiotherapist or combination of all three - ensuring you have the best chance of a speedy recovery. If you have a preference for one type of approach over another, that’s fine with us - at Agilaflex you are able to receive top quality assessment and care with the practitioner of your choice. What matters to us is that you have that choice. Rather than promoting an individual approach, we offer total professional care for your back, neck and joints. There is a world of difference. We have brought together an outstanding team of the very best chiropractors, osteopaths and physiotherapists, all of whom are experts in their area of specialism. They are committed to driving forward the standard of non-surgical back, neck and joint care, and to leading the field in its private provision. All Agilaflex practitioners are fully qualified and registered with the statutory regulatory bodies in the UK - the General Chiropractic Council, the General Osteopathic Council and the Health Professions Council, as well as the various industry bodies. Your initial assessment will be carried out by one of our qualified clinicians, who will conduct a thorough physical examination and gain a confidential understanding of your full medical history. This allows us to assess your state of health and any possible causes of your back, neck or joint pain. This examination may be complemented with an on-site X-ray examination, if deemed necessary. Depending on your diagnosis, your clinician may then mobilise your joints, work on your muscles or manipulate the spine and other joints in a precise yet gentle way to improve movement, relieve pain and reduce nerve irritation and muscle spasms. We place a particular emphasis on providing you with effective exercises in order to relieve your pain at home and maintain the improvements with your clinician from one session to the next. You will notice that our approach to treatment is significantly different from that of most other practices, in that we combine muscle and joint work in equal measure with detailed guidance on complementary exercises. This dual passive / active approach leads to longer and more thorough appointments, better care and ultimately a faster recovery. The old approach, which is still prevalent among chiropractors and osteopaths, is to regard treatment as a ‘quick adjustment’, i.e. the passive element only, in which a joint is manipulated in an appointment that may last no longer than 10 or 15 minutes. Finally, Agilaflex is concerned with your overall state of health so, with your agreement, we will keep your GP informed about your care with us to enable them to maintain your health record. Likewise, if there is a condition that we are unable to assist with, we will refer you immediately to an appropriate external practitioner. Chiropractor vs osteopath vs physiotherapist - which should I see and what's the difference? 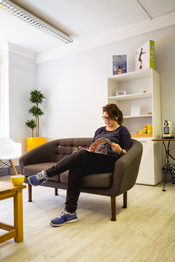 Book online, call us for an appointment or just come in and talk to us over a coffee.